It’s not a slot machine. It’s not video poker. 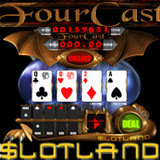 FourCast, the new game at Slotland.com, combines the thrills of cards and the quick, easy play of spinning slots in an exciting new game that challenges players’ psychic powers. Apart from the famous progressive jackpot tied to all of their 14 unique slot machines, FourCast has the biggest payouts available at Slotland.com. Players that can correctly predict both the suit and value of all four cards dealt can win $122,880 on a $10 bet. FourCast joins 13 other unique games at Slotland.com including bonus-crazy Treasure Box where players can hold the wheels after each spin, the five-payline Lucky Stars, and Booster – the only slot machine where your bet is never lost. Many of Slotland.com’s online games are also available on mobile phones and PDAs. Striking 7s, a variation of the popular Deuces Wild video poker game, is one of the latest to be added to the WAP site. All of Slotland.com’s web and mobile games are tied into the same progressive jackpot that has been hit for more than $150,000 twice this summer. Slotland.com is one of the most trusted online gambling sites and has loyal players around the world, including the United States.